We enter the terminal for the first time as platinum cruisers. This means that we will be in boarding group 1 (the first ones on the ship). We’ve been in boarding group 2 before, but not without some kicking and screaming on our part. Several instances of mistakes being made and the ball being dropped have resulted in our early boarding, but this time promises to go smoothly. Everyone will still be smiling by the time we board. In the terminal is the most magical site I’ve ever seen. Keep in mind I have been to Disney World and on the Cruise more times than I can count on my fingers and toes. And THIS was, hands down, the most magical thing we’ve ever seen. 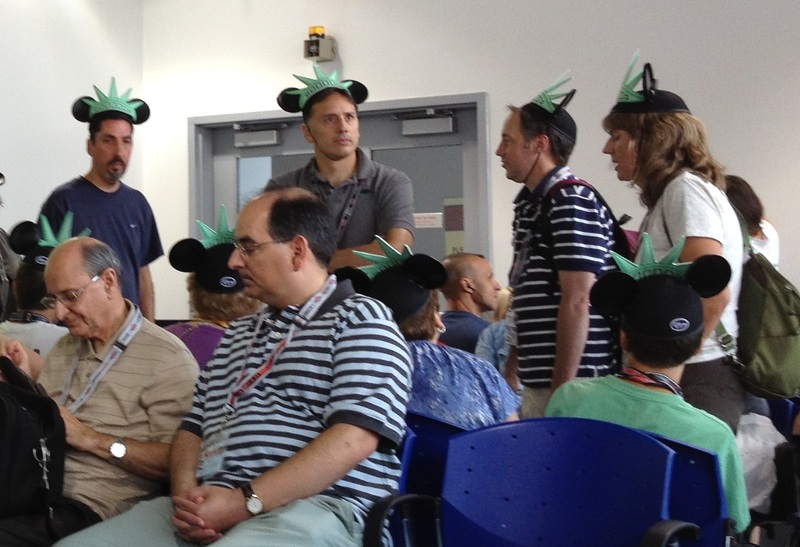 Three families, large families, wearing Mickey Mouse Ears with Statue of Liberty Hats. Babies, children, and adults. Moms AND dads. And no one was complaining. The dad’s were the best. I couldn’t resist a picture. Then suddenly we hear screaming kids. Some of them were in octaves so high only dogs could have heard them. Mickey was here. I don’t think I’ve seen girls act like that since Ricky Martin came out of the stage door at Evita. When Boarding Group 1 was called we boarded proudly, stepping into the lobby as our names were announced to the ship. We ate up on deck, enjoying the view of New York just off the stern of the ship. After our meet and greet, lifeboat drill, and sail-away party we were on the move out of the harbor. 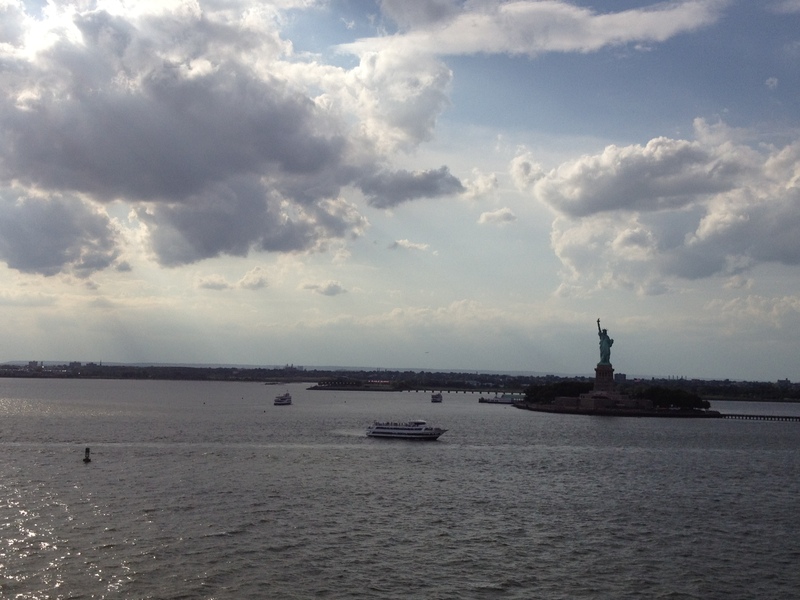 We ran to the rails on deck ten and watched as the Statue of Liberty passed us by on the starboard side. 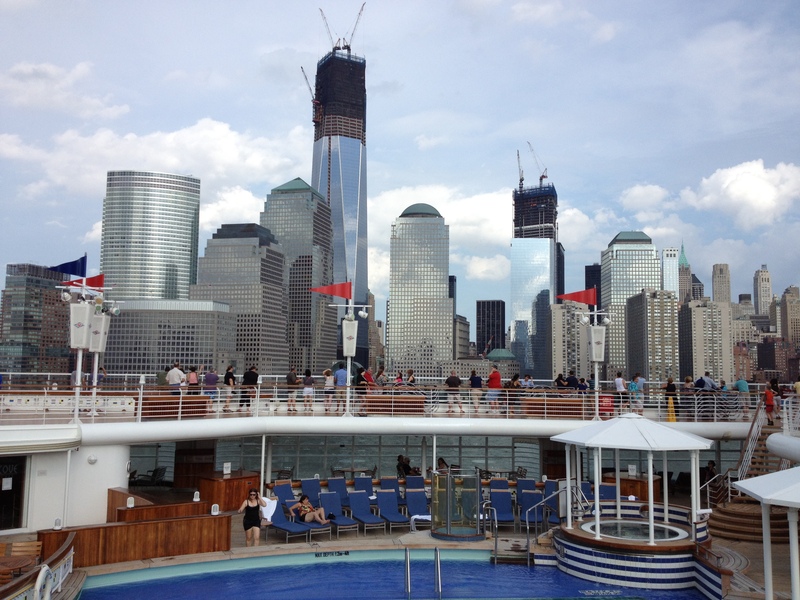 You could see towering buildings that seemed to be mere feet off the port side of the ship. What a beautiful way to see the city. Natalie: and bonded with our waitress, whose a fellow gamer and a fan of comic-con. Rachel: She accidentaly poured coffee into Natalie’s teacup at one point. Natalie: Is that exciting enough to mention? Rachel: I thought it was funny. We both had poached eggs over tomatoes and gluten-free toast for breakfast. One of the best breakfasts I’ve eaten so far. Natalie: Mmmm it was good. Rachel: Heading toward the cruise terminal we began to feel the Canadian/Alaskan cooler temperatures. Upon arrival in the terminal we were given a very late boarding number although we had registered online much earlier than most. After mom brought this to the attention of the terminal staff we were given a new number. A magical number. Boarding number 2. Rachel: Heading straight for the top deck we noticed High School Musical playing on the flat screen. After singing along for a bit we got lunch from Beach Blanket Buffet and enjoyed the view of Vancouver. Probably the most exciting thing about boarding the boat is smelling the familiar smells. It sounds weird but those are the things that make it feel like a second home. Shortly after lunch Natalie and I headed to the jogging deck to play some shuffleboard before the old people took over. Natalie: I wish I had something funny to say here. Rachel: By the end of the afternoon we had developed a new handshake. Natalie: A second handshake. In addition to our first one which came up during the airport. Did you mention that before? Rachel: Mhmm. Around 3:00 we met up with some of the people that mom met online before the cruise began. They were very nice and Natalie made some new friends. Natalie: Pfff. Wha…You’re typing that…you’re typing that too! Rachel: Following our get-together it was time for the lifeboat drill. This year we didn’t have to wear the oversized lifejackets and were able to just go straight to the station. Right when we arrived we spotted one of the performers. Rachel: They stick out like soar thumbs. As he was explaining the procedure a man walked by and held his hand up to the bullhorn pushing it into Bradley’s mouth and causing the other staff on hand to choke back laughter. After coming back with a new bullhorn we were able to finish the procedure and then start up to the pool deck for the deck party. The sail-away party was great and we danced along with the cruise staff and counted down our launch. It was really neat to set sail and Natalie and I watched from our verandah as we passed under the Lions Gate Bridge. To the right of our room we could see the boy next door also watching. Natalie and I both agree that he looks like Peeta from The Hunger Games (the book, not the new movie). Every night there is a show in the Walt Disney Theatre (Broadway style and some of the best in the cruise industry). Tonight was the welcome show. As we waited for it to start Natalie tried to help the Spanish woman in front of us save 16 seats for her whole family. When the show finally started the family arrived and took up the entire center row. The show was spectacular and there was a little sneak peak of one of the acts from later nights. Basically it’s a guy playing guitar (very very well) and changing the words to well known songs to pertain to the cruise. He was very funny and we’re looking forward to his show later in the week. Following the show we went to watch Mickey Mania (a gameshow that’s insania and played by guests on the cruise). Natalie helped the winning team with their victory by correctly identifying and distorted picture of Chicken Little. Then came dinner–my personal favorite part of the cruise. We met our waiters who will be with us for every dinner throughout the cruise. Amp is the server in charge of drinks and she is from Thailand. Laura is from Manchester, England and has a wonderful accent. It’s going to be a fun week although they don’t think that we eat enough for dinner as of right now. We got to have gluten-free rolls with banana butter dip along with the other people which is always nice. That night we shared dinner with another family at an eight person table but they won’t be joining us tomorrow night or for the rest of the week–I guess we scared them off. That night I went to the college club to meet some of the other imbetweeners. We joked that the “B” on my key to the world card stands for “between” since the adults have an A and the minors have an M. It was nice to meet some of the kids my own age but I didn’t stay too long because it was the first night for karaoke! Natalie and I sang “Don’t go Breakin’ my Heart” by Elton John and Kiki Dee. It was a lot of fun and we even tried to dance a bit in the middle although this caused Natalie to drop her microphone. Next we walked the deck for about a mile and layed on the stage looking up at the….sky? When we got back to the room I took a shower to prepare for my first massage tomorrow morning!